Every extreme can be found on the roads that traverse the United Kingdom. The UK is home to some of the shortest roads in the world and one of the busiest motorways in Europe. From the steepest to the most haunted, there are many interesting roads in the UK. 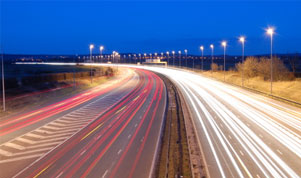 The longest motorway in the UK is the M6. Running from Junction 19 of the M1 near Rugby to Gretna and the A74(M) near Scotland, the M6 is also one of the UK's busiest routes. Communities along the M6 include Stoke-on-Trent, Birmingham, Manchester, Preston, Lancaster and Carlisle. The M6 first opened in 1958 and was completed in 2008. Its total length is 232.2 miles, or 373.7 kilometres. The A1 is the longest numbered or classified road in the United Kingdom. Linking London with Edinburgh, the road is 410 miles or 660 km. Among the towns and cities along the A1's route are Peterborough, Doncaster, Leeds, York, Darlington, Newcastle upon Tyne and Berwick-upon-Tweed. Designed in 1921, several sections of the A1 are upgraded as a motorway. The A1 is the most recent in a series of northern routes from London to York and beyond, including early routes during the Roman period. The longest B-road in the UK is the B6318. Linking Heddon-on-the-Wall and Langholm, the road runs parallel to Hadrian's Wall for much of its route. The road measures 61 miles or 98 kilometres. The longest ring road is the London Orbital. The 121-mile (195-km) route is also the longest ring road in the world. By comparison, one of the shortest roads and motorways in the UK is the A308(M). Measuring just 0.6 miles (1 km), the motorway is located in Berkshire between Junction 8/9 of the M4 and the A308. The westbound carriageway of the Leeds Inner Ring Road, which forms the A64(M), is even shorter at just 0.5 miles (0.8 km). At only 120 metres, one of the shortest roads is the A962 in Kirkwall, Northern Ireland. The A3125 in London and the A5016 in Ridley are also contenders for the shortest road, with both measuring just 160 metres. The widest multiple carriageway is found on the M61 in Greater Manchester where the motorway meets the M60 and A580. The road reaches a width of 2.5 miles (4 km) and features 18 lanes. The widest dual carriageway is the M25 at London's Heathrow Airport. Between junctions 14 and 15, the M25 features six lanes in each direction. By comparison, the narrowest motorway is found in Lancashire. The A601(M) east of the M6 measures just 24 feet or 7.3 metres for approximately a half mile. The narrowest road is Parliament Street in Exeter. Measuring just 48 inches (1.22 metres) at its widest point, the road is barely wide enough for two people to pass side-by-side. The road dates from the 14th century and is also claimed to be one of the world's narrowest roads. The M62 has the honour of being the highest motorway. At 1,221 feet (372 metres), the section of the motorway at Junction 22 is the highest point of the UK's motorway network. The section is located at Windy Hill close to Saddleworth Moor. Also among the highest roads in the UK is the M6 at Shap Summit in Cumbria. This section of the M6 reaches an elevation of 1,036 feet or 315 metres. The highest asphalt road in the UK is found in Knock, Northern Ireland. The private road links the village with a radar station at the summit of Great Dun Fell. At its highest point, the road reaches an elevation of 2,780 feet (847 metres). In terms of public roads, the A93 is reaches a high point of 2,182 feet (665 metres) near Cairnwell in the Eastern Highlands of Scotland. The lowest roads in the UK are found close to Holme, near Peterborough. The B660, the lowest classified road, is located east of Holme. A small lane north-east of the village is the lowest road at 5 feet, 4 inches (162 cm) below sea level. Also among the lowest roads is the A1101. Among the most dangerous roads in the UK, much of the route lies below sea level. Among the steepest roads is a small lane in Harlech, Wales. Ffordd pen Llech has a gradient of 40 percent, making it the steepest sign-posted road in the UK. The M25 around Heathrow Airport is the UK's busiest motorway. The section of the motorway between the M4 and M40 saw up to 196,000 vehicles in 2003. The M25 is also among Europe's busiest motorways. The most northerly is the B9087 in Norwick on the Shetland Islands. On the mainland, the most northerly road is the B855 at Dunnet Head near Thurso. The most easterly road is the A12 around Lowestoft, while the most westerly is the A46 at Belleek, Northern Ireland, and the B884 on the mainland at Lower Milovaig, Scotland. The most southerly roads are the A3112, which is found on St. Mary's Island, and the A3083 in Lizard, Cornwall. From ghostly sightings to eerie feelings, the UK is also home to a number of supposedly haunted roads. Lafarge Tarmac conducted a survey in 2006 to determine the most haunted roads. The M6 ranked as the spookiest road in the UK with the most ghostly sightings. The A9 in the Scottish Highlands ranked second. Among the sightings has been a Victorian coach drawn by white horses and footmen in period clothes. Platt Lane in Westhoughton ranked third. A small country lane, the route passes close to the Pretoria Pit mine where 344 miners died in 1910, although stories of creepy sightings date earlier than the disaster.